“Google” was once shorthand for “coolest and most forward-thinking workplace”, but as the economy shifts, so do the spaces that best support the innovation and ideas necessary to sustaining a business. In part one of his three part series, and in advance of our series of summer events exploring the workspaces of startups valued at over $1 billion, Bob Fox looks at the strategies in play today when it comes to building a high-performance workplace, asking specifically: what can post-recession startups tell us about the future of work? Google’s office in Milan. Photo by Bepe Raso, via archdaily.com. It wasn’t all that long ago that we would design and build row upon row of 10×15, fully-enclosed cardboard boxes with an acoustical tile ceiling, a 2×4 fluorescent light fixture, some off-gassing carpeting, a desk, and a non-ergonomic chair. The door would be closed, and the air would be re-circulated over and over again. Then a person (likely a smoker) would live in that space for eight plus hours, separated from all of his colleagues. Here, he was expected to perform at his best. Whether or not he performed his best is unknown — performance wasn’t always measured. Today however, the economy is different. Performance does matter — and that requires a completely different type of workplace. The traditional economy, as defined by Adam Smith in The Wealth of Nations, based on the three factors of production — land, labor, and capital — was comprised of transactional business and as a result, required record keeping, documentation, and clerical support. That fit neatly into rows of desks, file cabinets, offices, and buildings. More recently, the “knowledge economy” has built on ideas and experiences, which are fleeting, much like milk that expires or fruit that rots. If you don’t seize the idea and act on it while it is fresh, the idea and its value will be lost — no doubt acted upon by a nimbler, speedier participant. Influenced by the confluence of technology and the workplace, the knowledge economy now needs spaces that support the ability to capture these ideas: to share, communicate, iterate, and quickly develop them into sustainable business opportunities. The knowledge economy now needs spaces that support the ability to capture these ideas: to share, communicate, iterate, and quickly develop them into sustainable business opportunities. Yet, there is a large percentage of corporate America that still works in those 10×15 cardboard boxes. Organizations that remain there do so at great risk, not only to the health of their employees, but also to the long-term health of their companies. 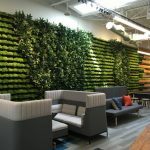 We have reached a tipping point where everyone realizes that we are working differently, and we’re recognizing the need, now more than ever, for a different type of workspace. The challenge is how to get there. The Great Recession was more than an economic slow-down. The typical patterns of business changed: there were businesses that started utilizing technology better and faster, and other businesses that were being disrupted. Things were out of sync more than at any time before. This is evident in the fact that between 2008 and 2009, there were more new startups than ever before. This development was predominately centered in Silicon Valley and was completely different from the banking crisis that was centered on the East Coast. They piggyback on existing technology. Companies such as Waze or Instagram are dependent upon the high-speed Internet connections and smartphones. The technology is core. In pre-recession companies, the organization came first and technology was made to fit the organization. Now, the technology is foundational and the organization is built around it. They collaborate in a brand new way. In pre-recession companies, collaboration meant that small groups would get together in rooms where ideas could be exchanged, iterated, developed, and refined into products and services. In the new startups, social networks are enabling real time collaboration, any time, any place. Collaboration can now occur simultaneously with thousands of interested people from around the globe. Valuations are extremely high, especially when compared to older, more traditional types of businesses. Investors recognize the potential for exponential growth of these new business models. Compared to these new companies, even Google may seem old-hat. These new startups are leaner, more agile, and more flexible. They are all about building an engaged community and strong relationships because they depend on that community for interaction, ideas, services, and support. The number of staff is relatively small, the revenue per employee tends to be high, and the growth is extremely rapid. Often they are dependent on the expertise of local individuals — think Uber — and will thrive in areas where there are a lot of interactive gathering places. These are the cauldrons of creativity, and the interaction of the community drives innovation and ideas. These new startups are leaner, more agile, and more flexible. They are all about building an engaged community and strong relationships because they depend on that community for interaction, ideas, services, and support. Talent. There is a talent war going on out there. Corporations have never been more concerned about finding and keeping the best talent. In the knowledge business you can’t compete without having the top talent. Speed of change. New ideas are developing rapidly and those companies who can’t innovate and provide client value are left to a painful downward spiral of death by commodity. Leadership. Visionary leadership is more critical than ever. The challenge today is to have leaders who value people, know how to keep them happy, ask the right questions to find the best ideas, and allow for failure. A company cannot innovate unless you accept and embrace failure. Next week, in part two, we’ll explore how disruption plays into all of this, how your workplace can ensure the long-term sustainability of your business, and whether it’s more valuable to improve innovation and the development of new ideas, or to cut costs.